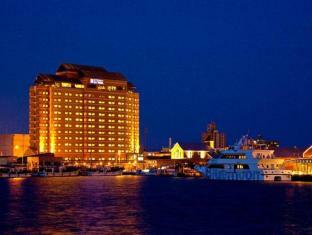 La Vista Hakodate Bay is perfectly located for both business and leisure guests in Hakodate. Both business travelers and tourists can enjoy the hotel's facilities and services. Service-minded staff will welcome and guide you at the La Vista Hakodate Bay. Designed for comfort, selected guestrooms offer bathrobes, complimentary bottled water, mini bar, television, bathtub to ensure a restful night. To enhance guests' stay, the hotel offers recreational facilities such as massage, sauna, spa. A welcoming atmosphere and excellent service are what you can expect during your stay at La Vista Hakodate Bay.